The new Moto Guzzi V7 Cafe Classic is a testament to what happens when you combine old-school looks with new-school technology. The result is a cafe racer version of the V7 Classic retro roadster that was introduced last year. 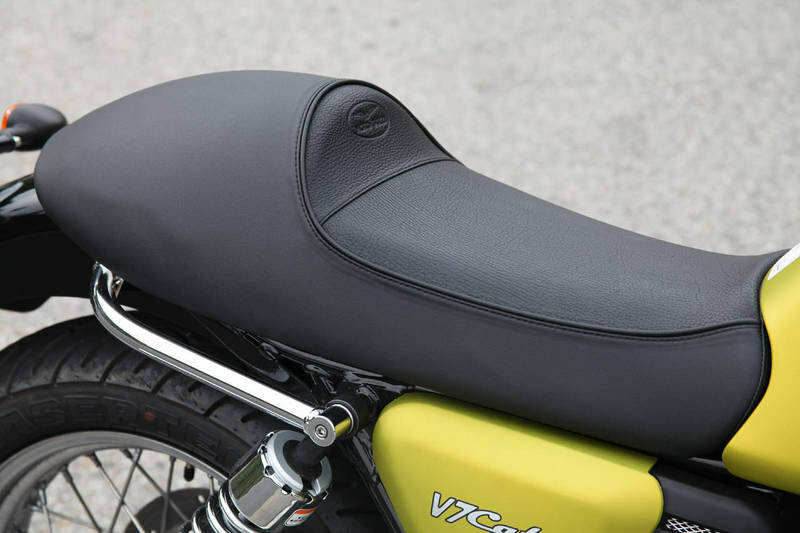 In terms of design, the V7 Cafe Classic packs plenty of unique features, including a 31.7" seat height, high pegs, and café-style bars that make for a comfortable ride courtesy of the bullet seat. Speaking of comfort, riding the Cafe Classic won’t give you the speed thrills you’re looking for, but what it does give you is a comfortable and classy ride on a bike that exudes retro awesomeness. Even the contrasted instrumentation and the elegant, aero-inspired filler cap exudes that old-school look that has become en vogue these days. 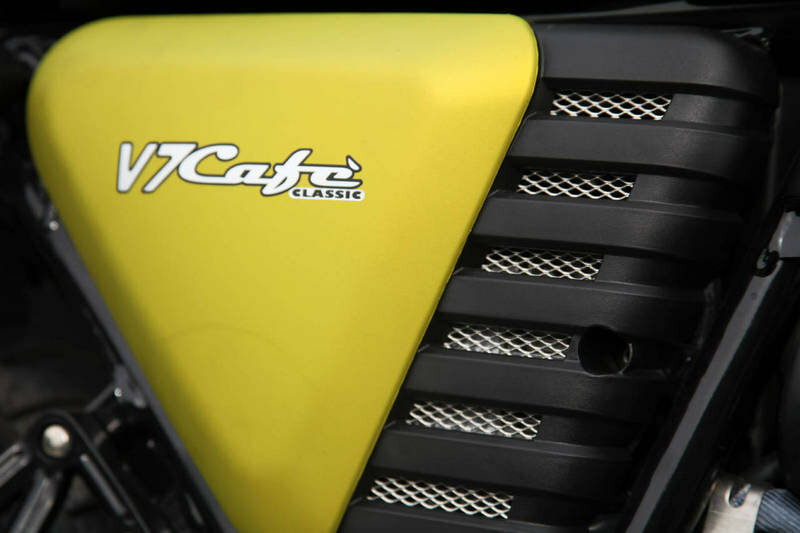 Speaking of the engine, the V7 Cafe Classic isn’t the most powerful bike on the market, but it does have a powertrain that’s more than capable of holding its own. 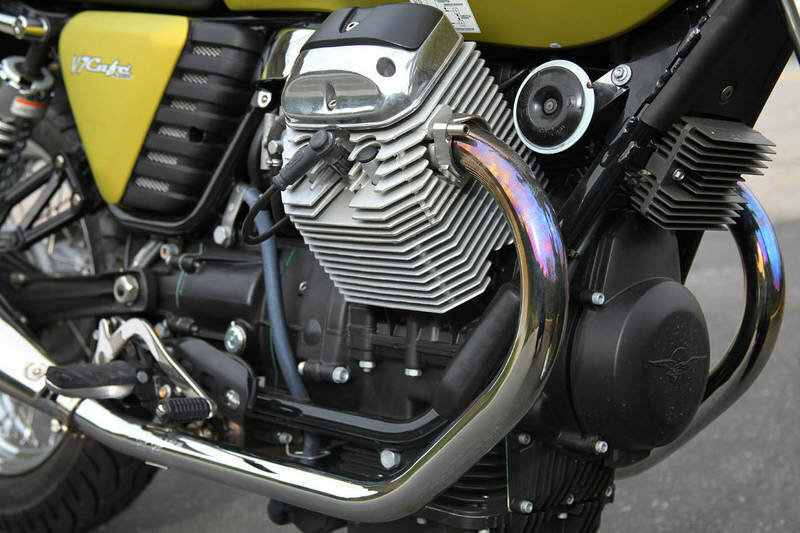 The bike is powered by Guzzi’s small block 750 Nevada V-twin powertrain in an old school twin shock chassis. This engine comes equipped with twin shocks, spoke wheels, and period Veglia-esque clocks, all of which add to the Classic’s vintage virtue. While the blacked-out frame, fenders, drivetrain, fork lowers, and a fast idle lever show more modern style, the combination of styling and performance makes for a bike that’s perfect for a ride out in town. 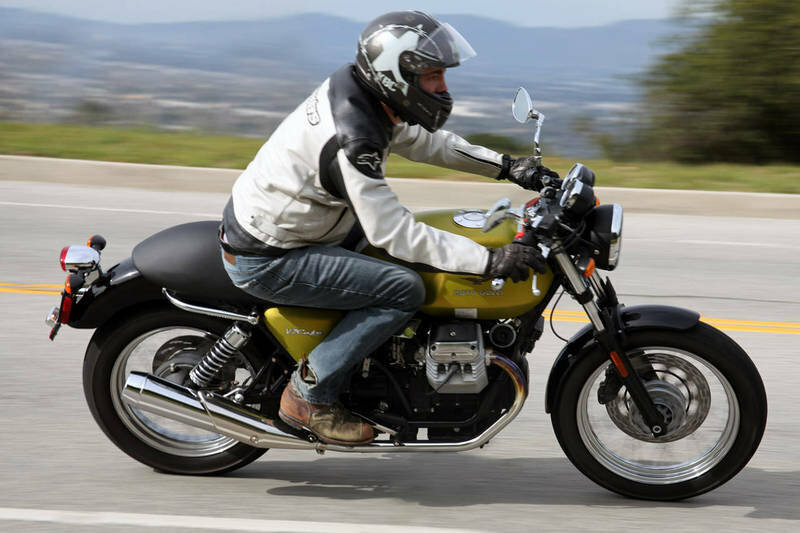 Find out more about the Moto Guzzi V7 Cafe Classic after the jump. We must step back 40 years to understand how the mythical Moto Guzzi V7 Sport, has evolved into today’s V7 Cafè Classic. In 1969 the Mandello del Lario mechanics increased the displacement of their transverse 90° V engine from 703 to 757cc which greatly increased the performance without diminishing the great reputation of reliability and sturdiness that was behind the success of the V7. 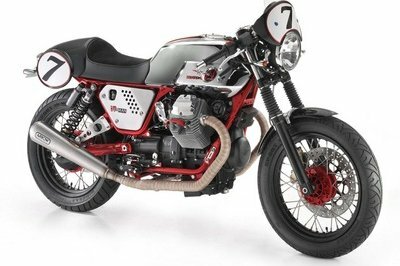 Fully aware of the power of this engine, Moto Guzzi decided to build a faired prototype of the V7 Special with the new 757cc engine. The result was an immediate success and set numerous speed records on the high speed ring of the Monza track. No one at that time had ever dreamt of achieving such results from a bike created from a touring bike like the V7 Special. 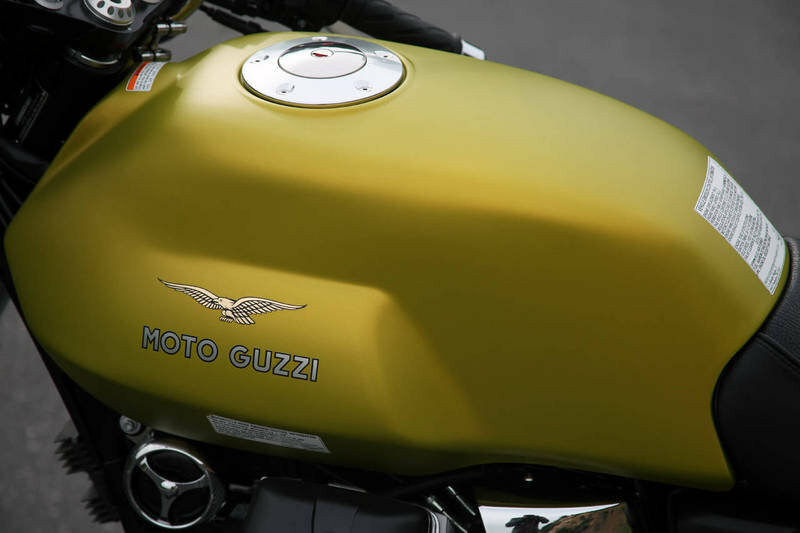 The effects of such an accomplishment gave Moto Guzzi the incentive to create a sports model. That task was given to Lino Tonti, one of the most brilliant Italian designers in history. 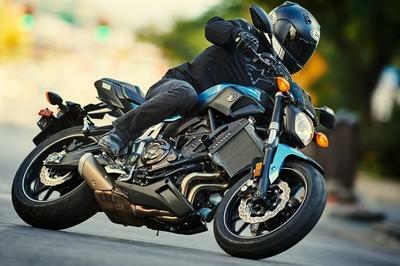 Boasting excellent performance, the V7 Sport impressed the public and critics alike for being one of a few, mass produced bikes in the world, able to exceed a maximum speed of 125 mph. This original icon of “Italian style” sports bikes, magically reappears today in the distinct lines of the new V7 Cafè Classic. The similarities with its renowned ancestor are easy to see in the unique color, rich chrome, and other stylistic features common to both. 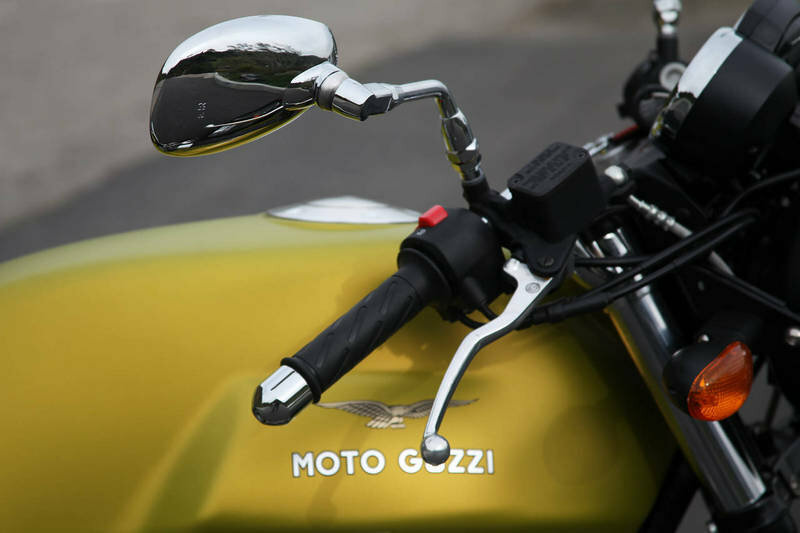 The slanted half-handlebars, the instrument cockpit and other details are unmistakably Moto Guzzi V7. V7 Cafè Classic’s design is very similar to the style of the famous V7 Sport, faithfully maintaining the forms and size of the tank and side covers. This style is one of the very best examples of Italian design of the 70s, so famous in fact that trade press didn’t delay in declaring the V7 Sport the archetype of Italian sport bikes where the essence of style conveys the effectiveness of the function for which the bike was designed. 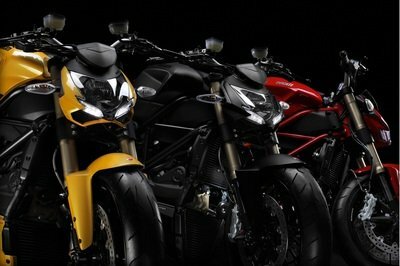 There are many similarities between the original V7 Sport and the new V7 Cafè Classic starting with the particularly compact front thanks to the two slanting half-handlebars that tempt the rider to take an aerodynamic position with eyes on the instruments and body just a span from the top of the tank, the latter painted in the “Legnano” colors, a shade of green and metallic gold that, in a satin tone, reminds us of the typical color of the sportiest Moto Guzzi bikes. Celebration of the “Seventies” style continues with the profusion of chroming, spoke wheels, upswept mufflers, the instrument dials inspired by the famous Veglia-Borletti and the seat with integrated tail that follows the line of the rear fender, the latter in a dark color matching the front. V7 Cafè Classic is a light and compact motorcycle, immediately offering you the feeling of being in control thanks to the decidedly sporty riding position. The rider is not forced to squeeze into the indents of the tank, on the V7 Cafè Classic you get comfortable in the saddle sitting down into it, in the classic style of the 70s. 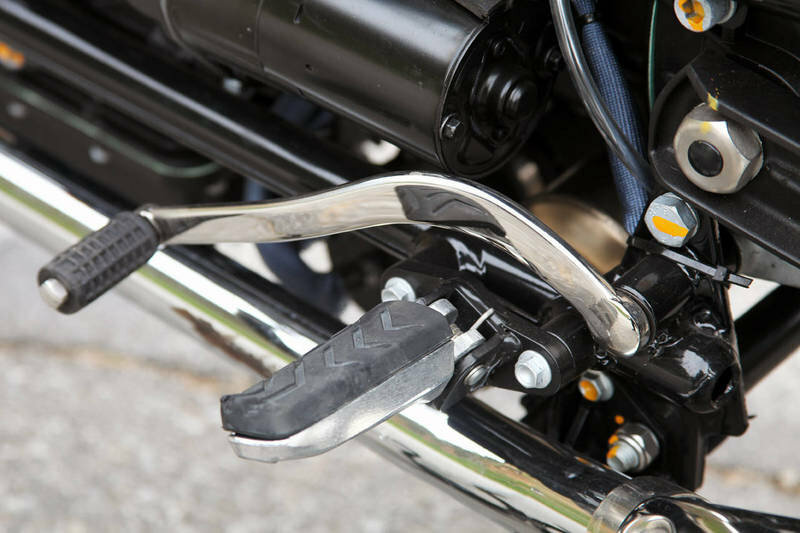 The footrest, saddle and handlebar “triangle” position has been designed in such a way that most of the rider’s weight is concentrated at the front as is good practice on sports bikes. This might give you the impression that the position is restricting but this is not so thanks to the correct slanting angle of the adjustable half-handlebars, the footrest that is slightly forward and to the generously padded saddle. 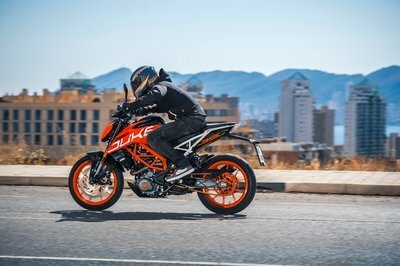 Rear suspension also helps greatly in terms of comfort with the dual shock absorbers that allow 118 mm of wheel travel and the ability to adjust the spring preload to adapt the suspension to different riding conditions. 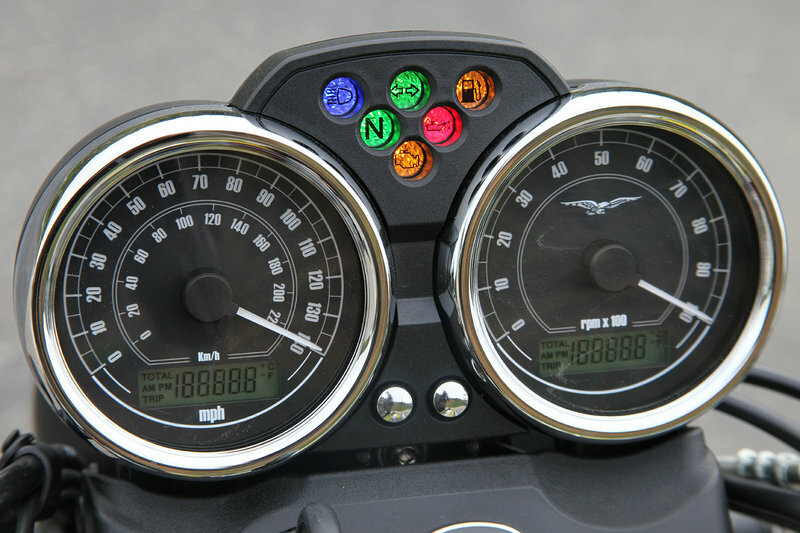 While riding, the cockpit that reminds us of the Veglia-Borletti instrument dials of the 70s is a real pleasure: but so we don’t forget that we’re riding a modern bike there’s a dual display with clock, external temperature and total/trip odometer functions that fits in discreetly with the speedometer and tachometer. As precise as a razor. 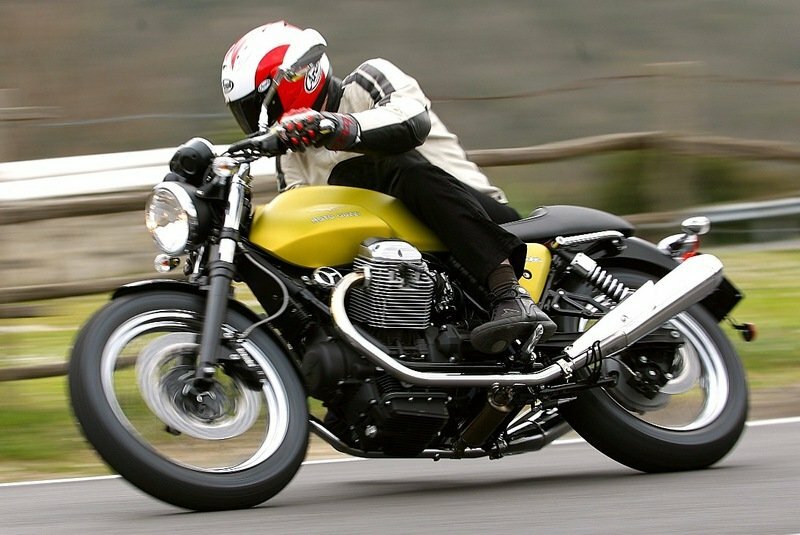 The versatility of the V7 Cafè Classic required a chassis that was suitable for in town riding and for the bends of a mountain pass, able to provide confidence during brisk riding but also guaranteeing comfort on a par with the Moto Guzzi reputation. A chassis with top quality components offers excellent road-holding qualities and stability that makes riding easy and pleasant for novices but is also appreciated by expert riders. The key element of the bike is the double-cradle frame with bolted, removable bottom tubes. A great deal of care has been taken with steering geometry where the headstock slants 27°50’, an angle that ensures stability and precision when changing direction. The Marzocchi fork with 40 mm stems provides 130mm of front suspension travel and is combined with the action of two rear shock absorbers (with spring preloading adjustment) which extend 118 mm. Braking consists of a floating 320 mm front disc and a 260 mm rear. The wheel selection is also worthy of note, the front being 18” and the rear 17” for high profile tires that ensure excellent handling and steering feedback. 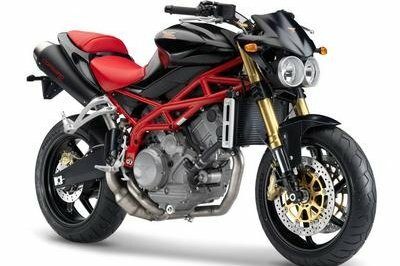 Famed for its reliability and low fuel consumption, the 744 cc 90° V twin with a bore of 80 mm and stroke of 74 mm houses special graphite low wear pistons in aluminum alloy cylinders. The small block from Mandello is fed by an electronic Weber Marelli fuel injection system with 36 mm throttle bodies and a Lambda probe that allows the engine to run smooth and with low exhaust emissions. In terms of maximum performance, peak torque of 54.7 Nm comes in at only 3600 rpm while maximum power output is nearly 50 CV. This power is synchronized to perfection with the characteristics of the V7 Cafè Classic. This bike has no need to race against the clock, it was built to enjoy the ride. Like the Moto Guzzi, of the past the booming sound from the V twin provides great music to ride with. The five-speed gearbox is precise with neutral easy to find and the ratios have been chosen for best performance and good economy. Intake valve closure: 50° after LDC. exhaust valve closure: 15° after TDC. Fuel supply Weber-Marelli electronic fuel injection. Rear suspension Oscillating light alloy swingarm with 2 pre-load adjustable shock absorbers. Rear wheel spoken steel rims 3.50" X17"
Ultimatemotorcycle ---- "Like the first fluttering skirts of a Roman spring, Moto Guzzi’s alluringly sleek V7 Café Classic intends to provoke a riot of impure thoughts along the Eternal City’s cobblestoned streets." Visordown ---- "Much more in keeping with an original V7 Sport from 1969, the Café Classic sports the bump-stop seat for one, clip on bars and tank, and panels as faithful as modern construction techniques allow. The metallic greeny gold paint is supposed to be reminiscent of the original paint on the original bikes. They couldn’t match it exactly, as there was never a consistent enough batch produced back then, almost every bike is slightly different. Fortunately the new bikes will all look the same. Looking at the Café Classic it’s a beauty; flowing lines and complimenting paint can’t help but draw you in for a closer look." Bikez ---- "Return of a legend. 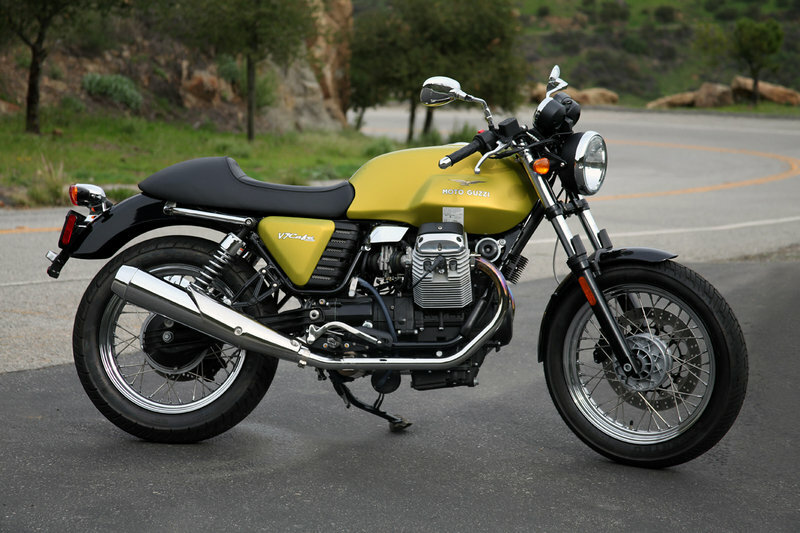 We must step back 40 years to understand how the mythical Moto Guzzi V7 Sport, has evolved into today’s V7 Cafè Classic. In 1969 the Mandello del Lario mechanics increased the displacement of their transverse 90° V engine from 703 to 757cc which greatly increased the performance without diminishing the great reputation of reliability and sturdiness that was behind the success of the V7."